Legacy Christian junior Halacie Oliver (6) drives deep into Yellow Springs territory as Bulldog junior Becca Spencer defends, in the first half of Friday’s Sept. 14 girls high school soccer match at Yellow Springs High. The visiting Knights won the girls contest, 8-0. Freshman halfback Cedar Palmer of Yellow Springs gains control of the ball as senior teammate David Walker (16) trails the play, Friday, Sept. 14 in a boys high school soccer match with visiting Legacy Christian Academy. Yellow Springs won the boys contest by a score of 6-1. YELLOW SPRINGS — While most every other school in the area was having a football Friday, Metro Buckeye Conference foes Legacy Christian and Yellow Springs had a “Futbol Friday” of their own, Sept. 14, with a boys and girls high school soccer doubleheader at Yellow Springs High School. The two teams that should’ve won, did. And the two teams that were underdogs, made the favorites work for both wins. In the girls match, Legacy Christian jumped out to an early 3-0 lead in the first 15 minutes of the contest. The Knights (5-1 overall, now 3-1 in the MBC) then extended that cushion into an 8-0 win. LCA pulled out the win with balanced scoring, too. Of the eight goals, seven Knights players scored them. Maya Ryder had two goals, while Sarah Harmon, Caitlin Erlandson, Emma Hess, Maddy Combs, Katie Leach and Emily Riddle each scored once. “We’re really an unselfish team. 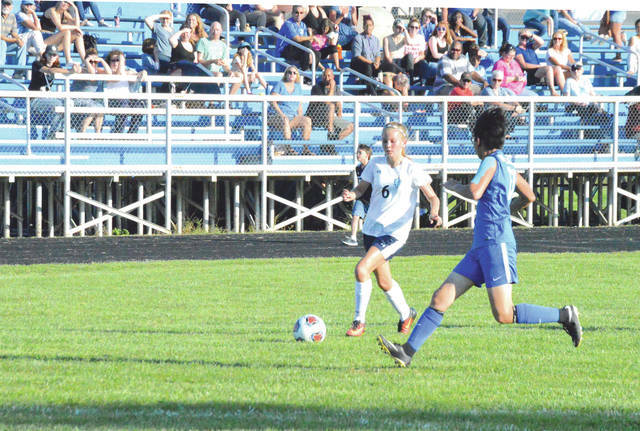 Seven girls scored eight goals, that makes us pretty happy,” said Assistant Coach Sharon Leach, who was filling in for head coach Celeste Davis. Yellow Springs’ girls team is coming along fundamentally. The team’s play left first-year coach Kate Lohmeyer encouraged, despite the loss. The Bulldog boys soccer team (5-1-1 overall, 2-0 MBC) is already considered one of the top programs in the area. They had another solid outing in a 6-1 win Friday night over LCA. Bulldogs senior Mateus Cussiolii, recorded a hat trick (three goals) in the Yellow Springs win. 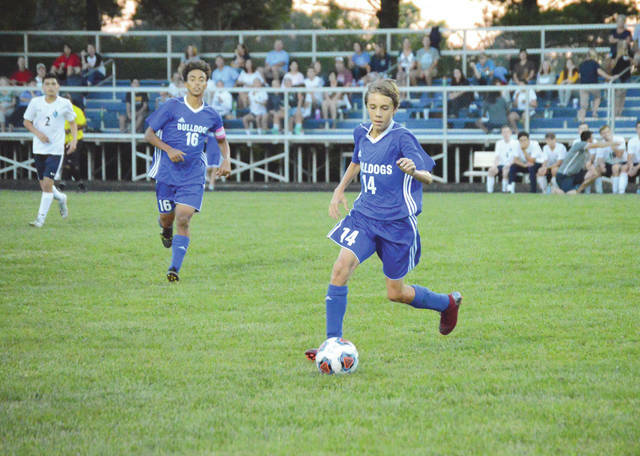 Senior co-captain Teymour Fultz scored on a first-half penalty kick, sophomore Kayden Bryan scored twice in the second half and had been fouled to set up Fultz’s score, in the Yellow Springs win. Legacy’s Jason Gay curled a long pass to his right from about 40 yards out where Alan Brads appeared to take the kick from behind the Yellow Springs defense for a quick one-timer into the goal for the Knights’ lone score. LCA is now 1-4-1, 0-4 in the MBC. “In the second half, we made some changes to our lineup and I think we handled the ball much better,” Bulldogs boys coach Ben VanAusdale said. “Mateus is something else. He had a really good game today. He’s usually marked, and often double teamed. But he finds his teammates really well, and he takes advantage when he’s open. Legacy Christian’s two teams will once again have a doubleheader for their next matches. The Knights have a girls 4 p.m. contest, followed by a boys 6 p.m. match, on Saturday, Sept. 15 on the Athletes In Action artificial turf field. Yellow Springs’s girls team hosts Stivers for a 5 p.m. match on Monday, Sept. 17 for their next contest. The Bulldog boys will host Miami East the following day for a 7 p.m. game.